To make it through the dark, cruel season that’s called Autumn/Winter tall boots are indispensable. In my conquest for the right pair I had to face the fact: nice boots are (almost) unaffordable. A pair of (expensive), gorgeous, breathtaking caramel coloured ones stole my fashionista-heart at the end of August. 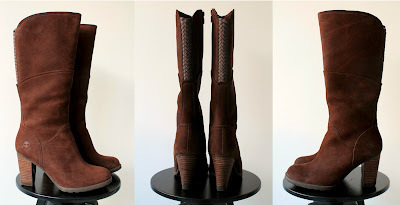 What followed: budgeting and re-budgeting, fitting sessions, endless window shopping (on the internet and for real, hoping to bump into some sale lookalikes) … The boots totally ruled my life and were driving me kind of crazy. I found myself at home sitting on the ground surrounded by shoes, hesitant about what footwear could be sold in order to save extra boot money and considering all pros and cons of the new versus the old. Briefly: my mind was occupied, my evenings and weekends, well let’s say, bootyful. The suede adds a touch of "truffle" to the boots, right? As if they are covered with cacao. In the end, a few weeks after the crush had hit me I decided to suspend the purchase and save money. (Yup, even after all the time and „hard” work that I’d dedicated to the boots.) Then again, in the real end - only a few days after the delay decision - I found myself buying a pair of chocolate brown suede booties. Outlet price, Earthkeeping-level and hunger for chocolate must have made me change my mind. P.S. What I actually wanted to say with this post: even though I seemed to have chosen caramel over chocolate it appears that true passion (for chocolate that is) conquers all, even when it’s about boots.